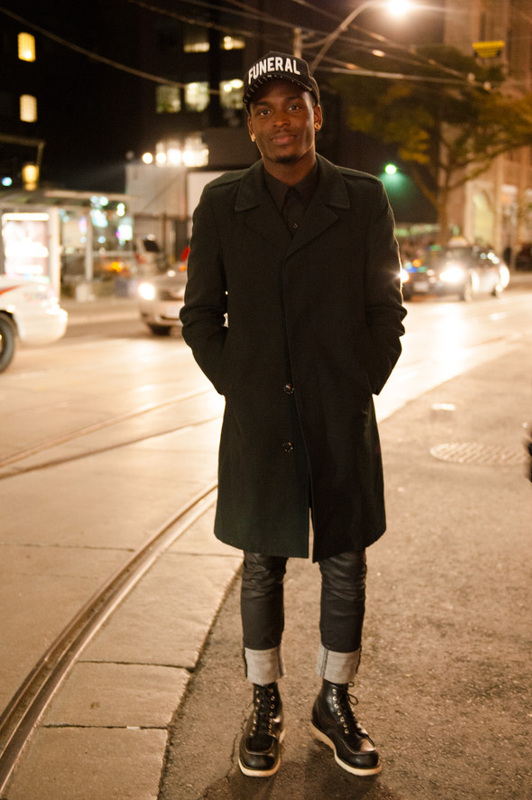 Men's street style in Toronto is in constant flux as the city's fashion community and menswear retail scene continue to expand. With a growing Fashion Week that features strong showings from local menswear designers (including Klaxon Howl, Sid Neigum, and Christopher Bates) and a burgeoning reputation as a harbour for thread-wealthy boutiques, Toronto's gents are drawing from local resources to establish their own fashion go-tos. 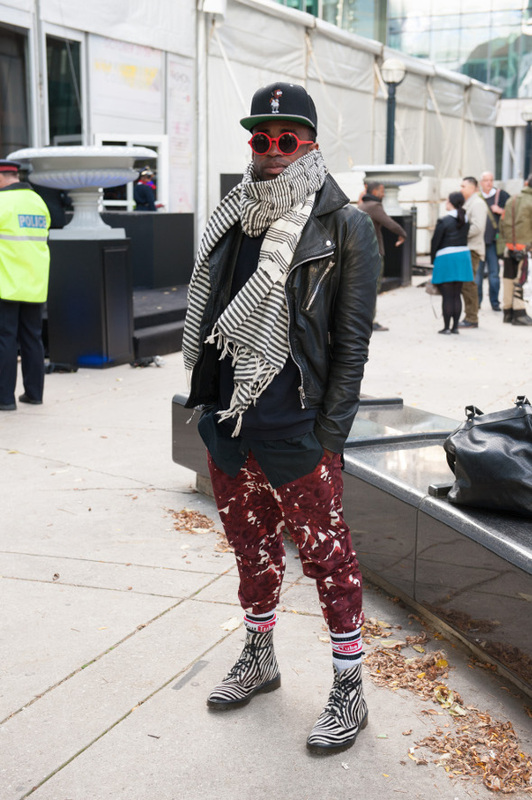 Here are 10 styles that define men's street fashion in Toronto. Otherwise known as "mad style" (Ă la Don Draper), these gents dress head-to-toe in timeless silhouettes and tailored staple pieces. Slim, deep blue suits are topped off with skinny ties and freshly shined shoes. They know how to keep their whites crisp, what to do to maintain the perfect cuff on a dark-wash denim, how to fold a pocket square, and just how fitted a fitted jacket should be. Think back to deep-style hip-hop of the 90s - patterned bomber jackets, tracksuits, chinos, camouflage. 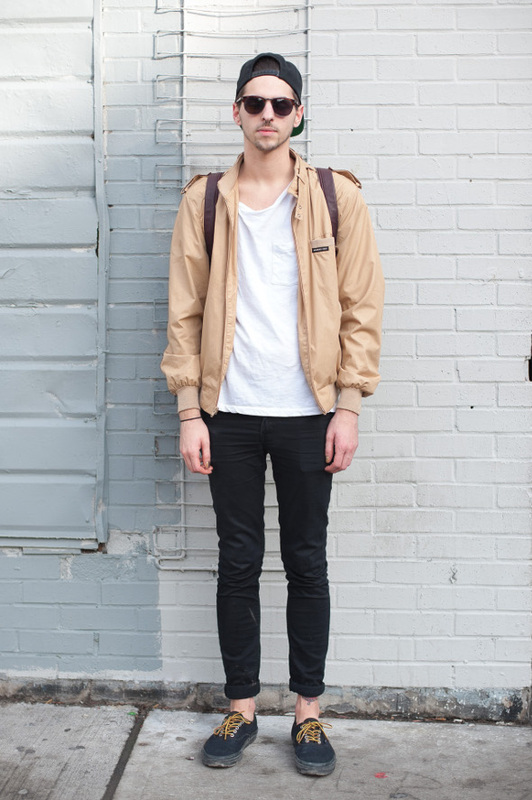 Set against a modern backdrop of minimalist, skater, and boyish hipster influences, these types prefer a more tailored look, opting for an easy-going, put together, and ultimately fresh approach. The term "rockabilly" comes from the combined genres of rock'n'roll and "hillbilly music" - who'd have known, right? 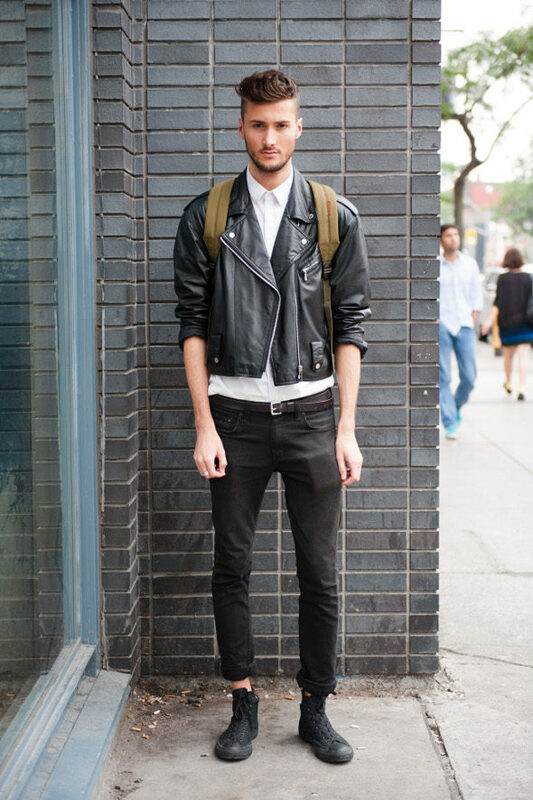 These Torontonians are clad in leather jackets, fitted, cuffed trousers, white T-shirts, slicked-back, undercut hair, and worn-in attire. In the 21st century, Modern Rockabilly is the badass version of comfortable, the retro variety of vintage, all-encompassed by the cool attitude of streetwear. You'll always notice this look when it walks - or rather, struts - into a room. It's a style with undeniable 70s influences (see: Earth, Wind & Fire, Al Green), clean-cut vintage finds, thrown in with a warmth and rich personal flair that says "oh hey, girl" (though it has far too much class for a line like that). Avant-garde is the conversation starter of styles. 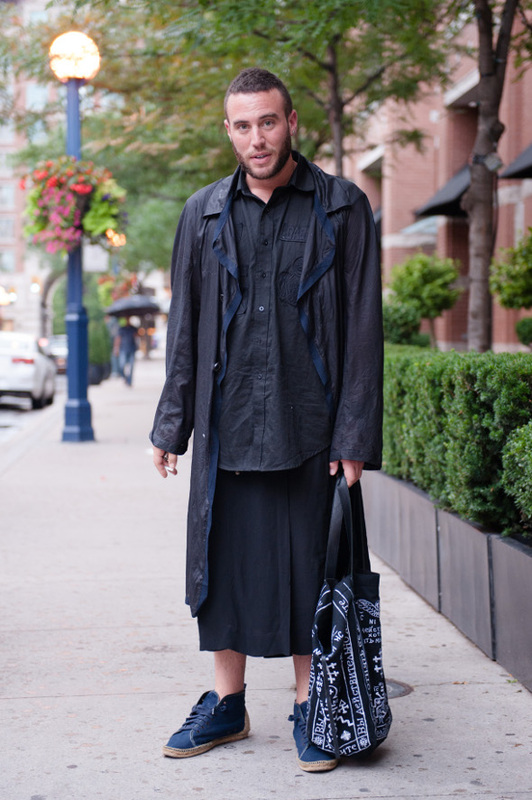 It's not often that you find someone who plays well with interesting silhouettes, open androgyny, and experimental fashions. Although the avant-garde guy typically dons all black attire, it's this blank canvas that makes their ultramodern aesthetics and thought-provoking use of clothing stand out all the more. A regular of Bonnaroo (going to Burning Man next year, bro), beach bonfires, and the occasional art school soirĂŠe, he's the teen-at-heart giving a nod to adulthood via buttoned-to-the-neck, short-sleeved tropical-printed shirts and khakis. On most days, though, his wardrobe consists of modern skatewear: ironic t-shirts or brand-heavy tank tops, beat-up sneakers, holey jeans, and five-sided caps. Oh, and Urban Outfitters. So much Urban Outfitters. They just barely border on too cool for the Financial District, repping a sensibility that's entrepreneurial and fresh. They're a business-savvy private school boy grown up and wrapped in red trousers, slim-fit shirts, pea coats, and the like, toting the latest issue of GQ. He's an old-fashioned drinker who's nowhere near old-fashioned; a condo-price talkin', jet-settin' alpha male. A minimalist's closet must look much like that of Homer Simpson's pared-down wardrobe: a selection of single-shade pants, shirts of the same size and shape, and an infinite collection of repeat shoe styles. Those bare-bones aesthetics are expressed in black and white monochrome ensembles, served with a side dish of a "use less" mentality. They're sensible and practical. This is the Alexander Wang generation - get used to it. Boyish chic is where clean-cut and polished preppy meets a hint of feminine prints and colours: Orange bermuda shorts and a teal polo shirt? Yes, please. Paisley paired with stripes? In perfect moderation. Often shy with a hint of sass. Never underdressed. Not all personal styles are representative of a single genre or look - eclectics borrow pieces from different genres, mix high and low, and reference a variety of cultures and time periods, all of which ultimately create a look that's all their own. Key looks to the pop art eclectic include bright colours, fun silhouettes, playful accessories, and super fun pop culture references. Writing by Alex Brown. 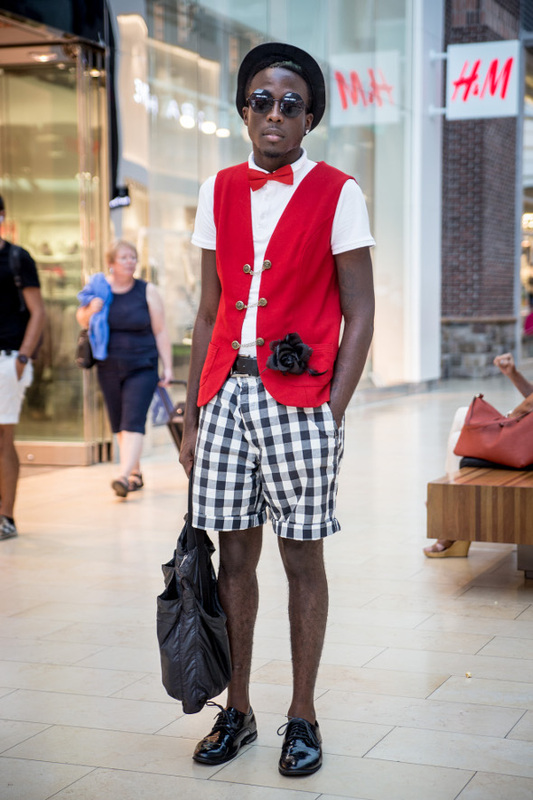 Street style photos by Mauricio Calero.